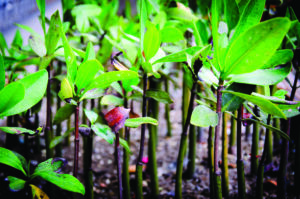 Protecting environmentally sensitive and important mangroves, determining the impact of micro-plastics on area waters and game fish and helping to improve the health of aquarium fish during transport are just a few of the many research projects upon which Blair Foundation gifts have made an impact at Florida Gulf Coast University. The foundation’s gifts this year have again made scholarships and grants possible to students majoring in Environmental Engineering, Environmental Science and Marine Science. These scholarships are awarded to first-generation students as well as those who qualify academically and demonstrate serious commitment to protecting the environment through their studies, research and volunteer service. The Foundation is named for philanthropists and ardent conservationists Dorothy and John Blair, who became Naples residents in 1967. Today, family members serve as trustees of the foundation. Red mangroves near FGCU’s Vester Field Station in Bonita Springs. Since 2014, the Blair Foundation has provided funding for FGCU students to study environmental impacts on the Southwest Florida ecosystem and beyond. The foundation has donated $225,000. Matching funds from Florida’s First Generation program added another $165,000, making it possible to provide scholarships to more than 70 students. Among this year’s scholarships, 10 were awarded to full-time undergraduate and master’s students who conducted summer research through FGCU’s Whitaker Center for Science, Technology, Engineering and Mathematics Education. Blair Foundation grant funds also were allocated to FGCU’s Vester Marine and Environmental Field Station in Bonita Springs to support studies that address local environmental issues. Michael Parsons, director of the Vester Field Station, said, “The Blair Foundation funding has allowed us to expand our capacity for student research and further utilization of the Vester Field Station. These projects will use the Vester Field Station for their base of operations, and the resulting work will help our community to minimize impacts on the environment. Associate Professor of Marine Sciences David Fugate conducts a lab at Vester Field Station. Other studies funded by Blair Foundation funds involve micro-plastics and nutrient recycling. 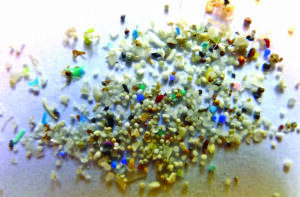 Micro-plastics are often invisible to the naked eye and can enter the food chain via fish. The Nutrient Recycling Study explores possible solutions to a problem experienced with the transport of aquarium fish when ammonia levels build up while fish are being transported, resulting in many deaths. By reducing ammonia levels, fish will remain healthier and more will survive transport. 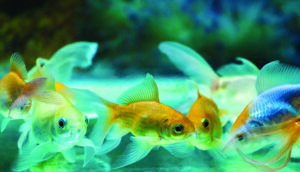 The Nutrient Recycling Study explores possible solutions to a problem experienced with the transport of aquarium fish. This study will increase survival rates of fish in transit, creating a positive economic impact on businesses and consumers, and will improve the sustainability of the aquarium fish trade — thereby protecting this resource for future generations.